I remember Shashi Tharoor each time I board a plane. Not because I love the way he flicks his hair but travelling 'cattle class' stirs exasperating farrago of emotions. Once in the plane, you grab your 36B and impatiently wait for ground clearance. I’m talking about the seat number, you pervert. There are ten planes ahead of you and the airline does its best to save fuel by not switching on the air conditioner before takeoff. You can suffocate to death in the fart and sweat soaked seats for all they care. Mind you, this is not some low cost airline but supposedly premium, all service Jet Airways – The Joy of Flying. That’s their tagline. If you are on a short flight, anxiety begins to play havoc with your bladder muscles. They go into an involuntary twist. The first thought that comes to mind is to rush to the nearest toilet before it gets drenched in dew drops and begins to smell of roses. As it happens, one bladder inspires other 149 bladders. Unfortunately, there is short window of release between take off and descent. As a result people queue up outside the toilet before the cabin crew distributes juice to ensure a mass bladder burst. 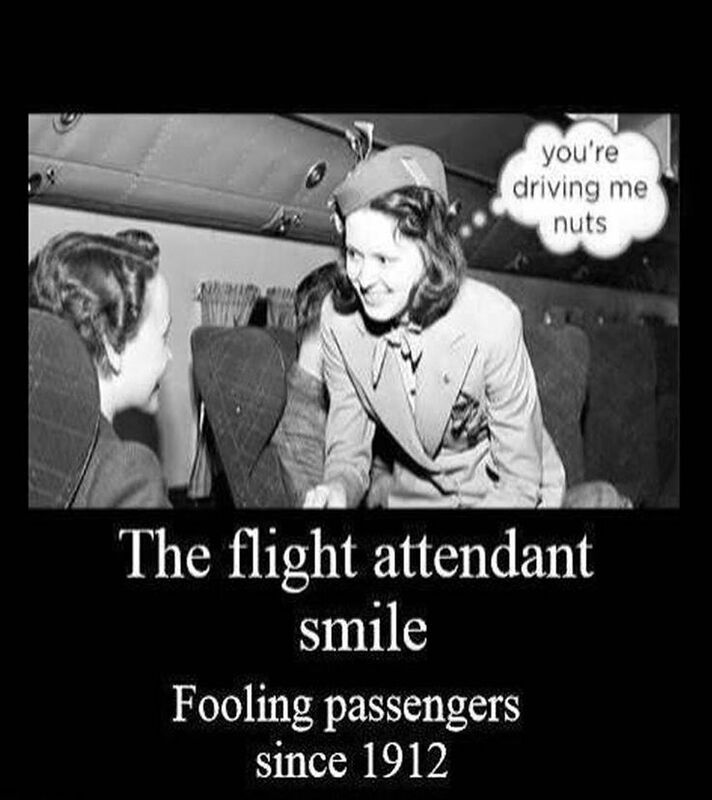 For some reason, the smiling stewardess who welcomed you with a chirpy ‘good morning’ gets all snappy. I don’t get it. Minutes ago she was pumping sunshine up our bottoms and now she is clouding it with ‘why the hell are you here’ expression. What happened? The old coot gets into an argument over the meal and after much doo-doo, it turns out that the quibble was over 15 grains of black gram accompanied with three cookie sized kulchas. If I offer this to my house-help she will screw her nose, ‘Didi aap kha lo’. Meanwhile others who are debating whether to pee or not to pee guzzle enough juice and beer to feel the force. Just when there is a queue of dozen loaded passengers, the seat belt sign is on. Crew on their seats, we are about to descend. You can almost feel the joy in her heart. Revenge. Is. Sweet. Never seen such imploring faces – Pee-lease…uff! The lady gets lucky. A dozen livid men return to their seats twisting their legs in awkward ways. Sitting on my window seat, I want to ask the lady, girl to girl, why should a menstruating lady get priority over someone about to wet his pants? Or soil his shorts? Eventually you land, hopefully at your destination (unless the pilot takes you to Jaipur or Lucknow due to air congestion over Delhi). You decide to be patient and sit tight before the groundstaff takes ages to fix the aerobridge. Turns out, sitting is a bad idea. Because everyone is standing and 149 booties are at your nose level. Direct transfer. We are the last to leave, but I now know why pee-ople itch to get out. Once at the airport, I find a sparkling clean toilet and I’m so happy, I could cry. Happiness, after all, is finding a place to go when you really gotta go. That’s the real joy. Not the joy of flying. Apologies for messing your morning with this un-pee-leasant post. 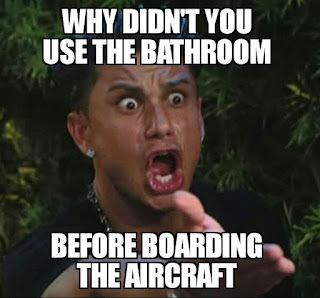 hehe I hate airline toilets. They are almost always occupied. The last Jet flight I took from Mumbai to Bangalore was quite comfortable. The food was pretty reasonable too. Except for the last minute change of gates which caused quite a stir as there were no announcements (silent zone). And the flight got a bit delayed at take off. But yes, the airport toilets are the best though I hate the long queues because everyone wants to go. This was my Jet after an year and I was very disappointed. Maybe it was the sector. But Vistara is so much better. Hahahaha Alka. This was a hilarious read. Now imagine a 14 hour non-stop flight. Flying is fun no more. The Airport look goes down the toilet in no time. Lovely read!! maza aa gaya. And your presence here made my day, thank you. Hahahahaha....this was the funniest thing ever! I hate plane loos. I feel claustrophobic so I avoid going as much as I can. But then as a result when I gota go I really gotta go and just when I have managed to fit myself in that miniscule space and closed the door the plane hits a turbulent spot and I don't know if I am going to die of claustrophobia or fright. I avoid them too, so no juice or beer for me. Hold it tight. Hahaha! Perfect observation! But you gotta travel in SpiceJet to experience their hospitality...err lack of it! Of the lot, my best experience has been with, believe it or not AI! Atleast they feed you well, even if they are seldom on time. Lastly, I still don't know how the inside of an airplane toilet looks! Blame it on bad memories from traveling Indian Railways. It's made me wary of all such public loos! Train or plane, toilets are a nightmare. Are plane toilets turning out to be today's train toilets?! LOL!! Loved the post!! Do write one about our desi railways toilets too! That would pee too gory, but may pee next time. Good one! My hubby has told me such horror stories of the plane loos that I ensure never using them. As for the joy of flying, the worst experience was when a Spicejet flight v took smelt heavily of asafoetida. And I was in my first trimester struggling with terrible morning sickness! Oh dear, one lady was about to puke in this flight too. But she was given a bag and told to go back to her seat. 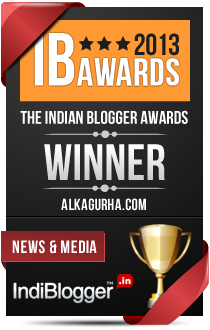 You have covered so many issues in this one blog, Alka. I remember the time when we used to find going by air a luxary but now I feel I rather go by train to places. Atleast I can stretch my body parts, have the luxary to use the bathroom, eat what I want to eat and when I want to! I hate crouching too. But train toilets are a nightmare early mornings. My mum went to Allahabad last month and narrated gory tales. Haha! Alka - I've missed reading such posts of yours. Thanks Sid, maypee I should travel more. lol, I have never been so observant. haha...I loved this. 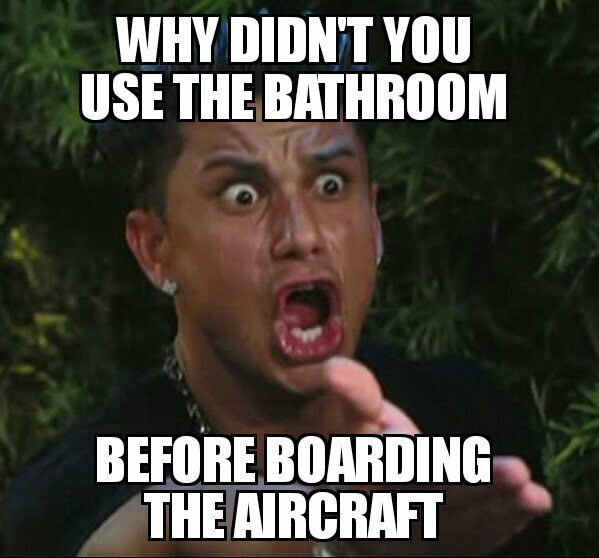 Every time S and I discuss why do people need to pee immediately after takeoff. Everything you have written about in here is so true!! Had fun reading this. good on alka as always. Am waiting to see your blog on the Joy after peeing. You have written this with a special pen. The humour is at its wryest best, but I swear, each of those strokes constitute the standard operating procedure of an average flight. Each of those miseries can visit you with the hardest impact you can imagine. Direct transfer? O Man! Menstruating rights? O God!! We are a graceful race. Thank you. Yes, it's routine for them. Flying used to be a luxury at one time, it's drudgery now. Haha, traveling with a baby is tough. Remember those days when my son was a toddler. I could write another one on that.Tx. When I was younger, I always had this strange thought - what happens to all the downloads (or uploads??) in aircraft loos; do they get released into the clouds like how things work in trains? Genuine query most of us had :-D Good to see you here after a long time. It's really sad and pathetic coming from one of the leading airlines. And, we thought customers rules.High time to make aircraft passenger friendly with food, toilet and comfort. After all,we are paying. Guess, they taking patrons for granted. Demand often surpasses supply in our country. We are just too many to handle. After so many years..... and still so funny!!! loved this one, Alka! So good to see you here Vinaya. Thank you for stopping by. Hope you are doing good. Nightmare situation : Descent is announced, Everyone is in Seat Belt Fastened and Plane is Circling due to congestion on Airport. Use of Toilet is Prohibited and Toilet is locked by Air Hostess.